Can a leaderless, agenda-less movement also survive without a home base? With the specter of eviction looming, Occupy Wall Street tested their “organized chaos” approach to protesting and wound up on Wall Street proper. Participants in the Occupy Wall Street demonstrations feared getting pushed out of their encampment in a lower Manhattan semi-private park today, but as word came down that about 2,000 people there this morning would not be evicted or asked to leave for a cleaning, they were emboldened enough to push the demonstrations out of Zuccotti Park themselves and onto the place that symbolizes their frustration: Wall Street. A crowd of at least 500 people took a circuitous route through the financial district at about 8 a.m. this morning, then they amassed on the street like never before. And they faced little police resistance–there were about 20 arrests with only shades of the aggressive treatment documented in the past (the exception being one astonishing display in which one person was apparently punched in the face by a cop; in another, well, demonstrative display by all involved, a National Legal Guild legal observer’s leg may have been run over by a police scooter). The NYPD is nothing if not efficient when it comes to corralling protestors, however (see: the 2004 Republican National Convention, under the same mayor). Did an order come down from management to go easier this time? Or, like the protestors they have been virtually living with for weeks, did the police self-organize a new strategy to deal with a fast-evolving situation? Either way, it’s not likely dumb luck that police didn’t quickly shut today’s rally when it went mobile. A look back on a series of moments that have made the movement feel different than any other. Signs, banners, and costumes have extra importance in a protest without a unified slogan [Slideshow]. The movement prides itself on its lack of central authority, but here are the people keeping it humming. Is the future of activism more digital than physical? In business, management often strives to empower colleagues to take initiative. But at Occupy Wall Street, colleagues without management empowered themselves and succeeded, at least on a logistical level today. The still not massive Wall Street movement continues to show an activist tenacity and a kind of endurance not usually associated the members of the Millennial generation in heavy attendance here. It’s an unusual, unexpected kind of protest that formed a group before it formed an agenda, rather than using the agenda–which, let’s face it, is a bit mind-numbing (corporate malfeasance, anyone? )–to form the group. 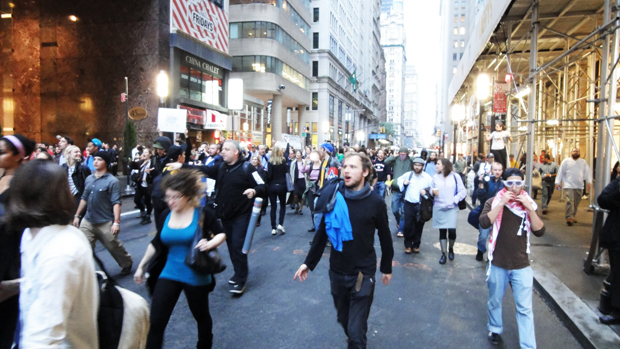 The oxymoronic nature of Occupy Wall Street could only come from anarchist organizers. 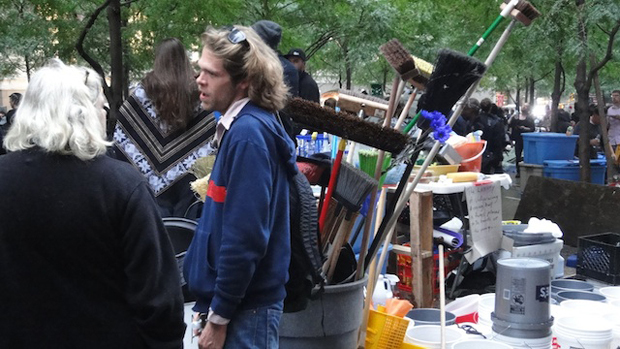 The trigger for today’s events in Manhattan was a plan by the City and owner Brookfield Office Properties to tidy up Zuccotti Park, which the movement calls home. To the protestors, that sounded like a pretext for “eviction.” And they had reason to fear. It was the tactic that the City used to break up the much-smaller June “Bloombergville” encampment protesting city budget cuts–the experience that brought together the core organizers of the unorganized movement. A last-minute stay of eviction, based on a legal appeal, not only diffused one situation but ignited another as protestors took to the streets like never before. The leaderless conglomeration showed a surprising level of leadership on an individual level, as protestors self-organized a strategy. In preparation, the “residents” stepped up their already aggressive housekeeping. “People are always cleaning up here,” said Keith, a young protestor who has been living at the park for nine days. “It’s incredibly clean. And I’m a germophobe.” Masses of water buckets, mops, and brooms were on hand. And residents tidied up their living spaces in hopeful anticipation of cooperating with the City on moving their stuff, cleaning the space, and moving back again. They also prepared for a legal cleanup. About a dozen members of the National Lawyers Guild, marked by their fluorescent-green caps, stood ready to intervene. Meanwhile, volunteers wrote the hotline phone number on people’s arms. “Putting it in your cellphone isn’t good enough,” one of them said. Even this tech-addicted crowd realizes that batteries may not last as long as their determination. But the Lawyers Guild wasn’t alone. 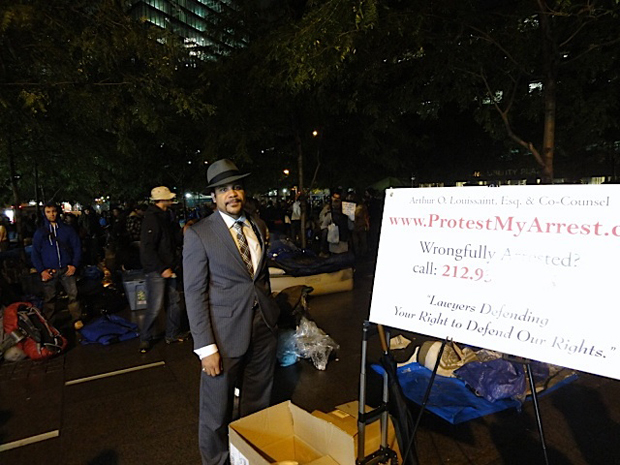 Dapper-dressed Arthur Loaissaint stood by a sign advertising his pro-bono services to help protestors. He said he was one of about 10 volunteers who had come out. “I’m not an organizer or a part of the movement,” Loaissaint explained. But by being there, with a plan, he’s as much an organizer as anyone. Few of the early organizers from the original general assembly took visible leadership roles. One person, who was a vocal part of the early organization, was there today merely as a bystander. The emerging dynamic will likely get its next test on Saturday, when protestors plan to take Times Square. Heads up to Bubba Gump Shrimp Co. patrons.